Let’s talk about SoftPerfect network scanner, a simple network tool that you can use to quickly scan your home network and look for active computer’s shared folders and access to them. 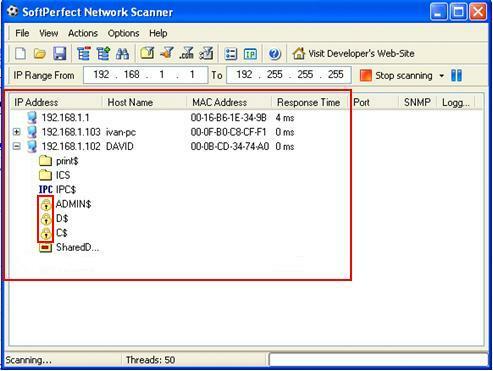 - Detects hardware (MAC) addresses even across routers. - Detects your internal and external IP addresses. - Detects hidden shared folders (normally invisible on the network) and write accessible shares. - Scans for listening TCP ports and SNMP services. - Retrieves currently logged-on users. - You can mount and explore network resources. - Can launch external third party applications. - Supports Wake-On-LAN and remote shutdown. 1) There is no installation needed and you do not need administrative privileges to run this tool, just double-click the downloaded file and run it. 2) Let’s do quick configuration, go to Options and click Program Options. 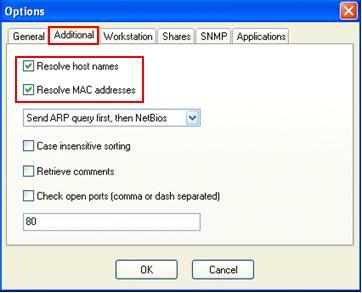 3) Go to Additional tab, tick on Resolve host names and Resolve MAC address options, so the program will resolve both hostname and MAC address. 4) Go to Shares tab, tick on Scan for shared resources and Check for write access options. Also check the Enumerate All radio button. 5) Ok. Let’s check your computer’s IP address by using ipconfig in command prompt (cmd.exe), after that key in the entire network range for scanning. Click Start scanning. 6) After successful network scanning, this network scanner will display all discovered computers with shared folders on your network. It will show you the hostname and MAC address of the computers as well. You can just double-click the shared folder to try accessing it. Note: For the shared folder showed with lock symbol, you need to provide username and password in order to access it. Note: ADMIN$, D$ and C$ are hidden and default shares on computer DAVID. It’s hidden because you won’t be able to see the folder if you type \\\\DAVID in address bar of file explorer.